Sometimes it's nice when you're visiting haunted houses to kind of know the experience you're going to get. With the plethora of haunts out there, most of which are not cheap, it's good in some cases to visit a known quantity, where you'll always be in for a good experience. The Massacre is one such haunt. With the Massacre, the experience is mostly the same from year to year, with similar sets and actors, but it's always enjoyable. 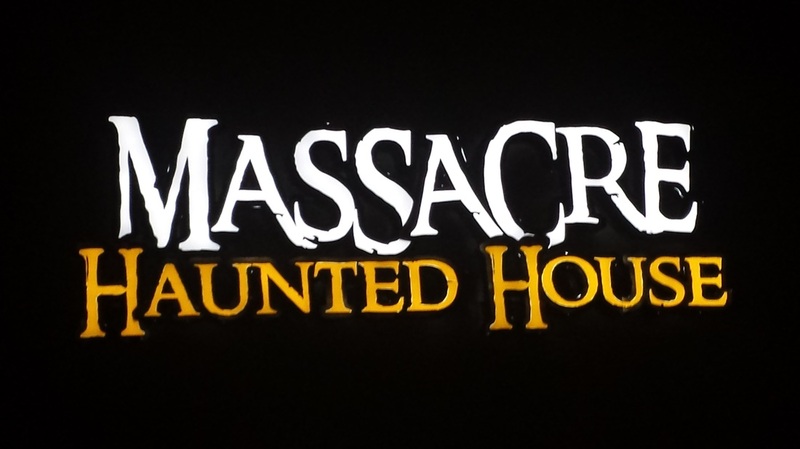 It's like that favorite blanket or pair of comfy shoes, or that comfort food we all turn to when we need it - if you're looking for a fun haunt experience that you can return to year after year, the Massacre fits the bill. At about 20 minutes long, it's a decent value for the money, and longer than other haunts in a similar price range. It's got a wide variety of rooms, with good set design and props. For those who've never been there, you'll probably marvel at the quality. Some good rooms include the crypt, the church room, the Exorcism room, and the native area complete with giant spiders and rickety rope bridge.or those that have been to the Massacre before, there are the actors - there are many, and they are varied, and since the Massacre likes to combine their scares with tongue-in-cheek humor, they are always entertaining. From the wait entertainment to the exit door, the actors are all over the place - laughing, cackling, mumbling and more. Some standouts this time around included the nun in the church room and her "pet" dog/man who invited us to try out his coffin, the "doctor" in the operation room singing "A Spoonful of Sugar", and the girl at the end who had some type of clicker in her hand who followed us from room to room just clicking and laughing. All great stuff. And a special mention must go to the wait entertainment. Pedo the Clown is always great as the mascot of the Massacre, and this year we had the added bonus of being entertained by Dead Elvis - a character dressed like the 50's Elvis (and rather tastefully as well), who walked around with a guitar asking for peoples' requests. He was a good singer as well, and didn't do any of the typical Elvis impersonator cliches, either, which was quite nice. He did a nice short rendition of Elvis' 1956 classic "Love Me" for us, so extra points for that. The one minor drawback to the Massacre is that is doesn't change much - if you've seen it in the past few years it's still mostly the same. Of course that means you'll know what you'll get, and if you liked it before you'll like it again, but it would also be nice to see some bigger changes as well. Still, though, you can't go wrong with the Massacre - it's a guaranteed good time!